Thank you for visiting Holy Names Music Center. 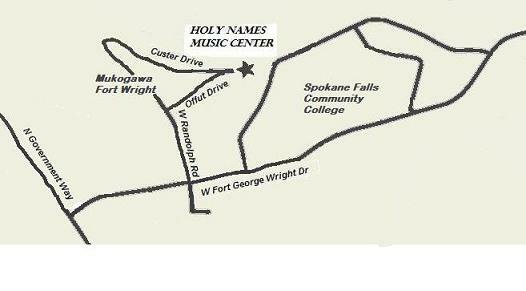 Holy Names Music Center is located on the beautiful, historic Mukogawa Fort Wright Institute Campus, just west of the Spokane Falls Community College Campus, in Northwest Spokane, Washington. 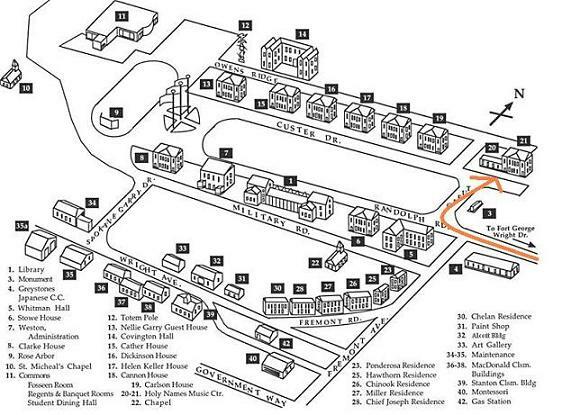 We are buildings 20 and 21 on the Mukogawa Fort Wright Institute Campus Map. Come in on Randolph Rd., and turn right. Lessons are by appointment only. Please contact our office Monday thru Thursday 10:30 – 5:30 or Friday from 10:30 – 2:00 pm or fill in our online form with any questions you may have and we will get back to you asap. We are always happy to help! Located in Spokane, Washington, on the beautiful Mukogawa – Fort Wright campus, Holy Names Music Center has been providing the highest quality music instruction for over a century, through private lessons, special programs, and summer camps. The Center serves students of all ages, abilities, income levels and ethnic origins from the entire Spokane community. We are happy to be able to offer full and partial scholarships so that anyone with sincere interest can participate.